Radford is an inner-city area of Nottingham, located just outside the city centre itself. 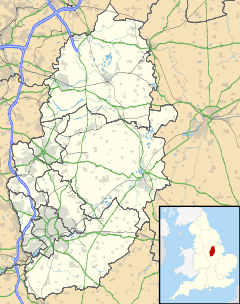 The appropriate ward of the City of Nottingham Council is called Radford and Park with a population of 21,414. It is bounded on the south by Lenton and Nottingham City Centre, and comprises around 600 acres (2.4 km2) of land. St Peter's Church, Radford was given by William Peveril to Lenton Priory. The church was rebuilt in 1812 at a cost of £2,000. The Wesleyan chapel was built in 1805 and enlarged in 1828. In September 1878 a chapel was built on St Peter's Street by the United Methodist Free Churches at a cost of £1,900. It was closed owing to declining membership and income in June 1947 and purchased by the Evangelical Free Church. Radford Registration District (RD) was created on 1 July 1837 on the introduction of Statutory Registration of Births, Marriages and Deaths (BMD) - and was abolished, and absorbed into Nottingham RD, on 1 July 1880. The area has a large ethnic minority population (mainly West Indian, African, Asian and increasingly Polish), and accordingly there is a large number of specialist food and retail shops catering to specific cultures, owing to the relatively cheap nature of housing in the area (and the large number of old Victorian properties converted into flats and bedsits). Radford has a large student population, most of whom attend the nearby Nottingham Trent University and University of Nottingham. Manlove, Alliott & Co. Ltd. inventors of incinerators for waste disposal. It provides the backdrop for much of Alan Sillitoe's book Saturday Night and Sunday Morning. Numerous scenes from the film of the book which starred Albert Finney were shot in Radford. ^ wearebase.com, Base,. "Service 28 on Pink Line". www.nctx.co.uk. ^ wearebase.com, Base,. "Service 31 on Pink Line". www.nctx.co.uk. ^ wearebase.com, Base,. "Service 80 on Turquoise Line". www.nctx.co.uk. ^ wearebase.com, Base,. "Rainbow one service by TrentBarton". www.trentbarton.co.uk. ^ wearebase.com, Base,. "L4 service by Nottingham Community Transport" (PDF). www.ct4n.co.uk. ^ wearebase.com, Base,. "L7 service by Nottingham Community Transport" (PDF). www.ct4n.co.uk. ^ wearebase.com, Base,. "L12 service by Nottingham Community Transport" (PDF). www.ct4n.co.uk. ^ wearebase.com, Base,. "L14 service by Nottingham Community Transport" (PDF). www.ct4n.co.uk. This page was last edited on 10 March 2018, at 15:12 (UTC).